03.04.2017, Oststeinbek (Germany) – Japanese cooling expert Scythe announces the PCGH Edition of the Mugen 5 CPU Cooler, which has been designed in collaboration with the German “PC Games Hardware” magazine with the aim to supply outstanding performance at significantly decreased noise levels! Mugen 5 PCGH Edition achieves this goal by bundling two instead of one Kaze Flex 120 PWM axial fans with a dynamic fan speed range of 300 to 800 RPM. The performance improvement is reached by using the push/pull principle. The PCGH Edition of Mugen 5 offers compatibility to all modern sockets including the new socket AM4. The first collaboration between Scythe and the PC Games Hardware magazine was successfully celebrated with the announcement of Mugen 2 PCGH Edition. New Mugen 5 PCGH Edition follows in the footsteps of the predecessor, offering two instead of only one fan. There is more to it, than just bundling two fans. The supplied Kaze Flex 120 PWM models are operating at maximum 800 RPM instead of 1.200 RPM of the regular model. 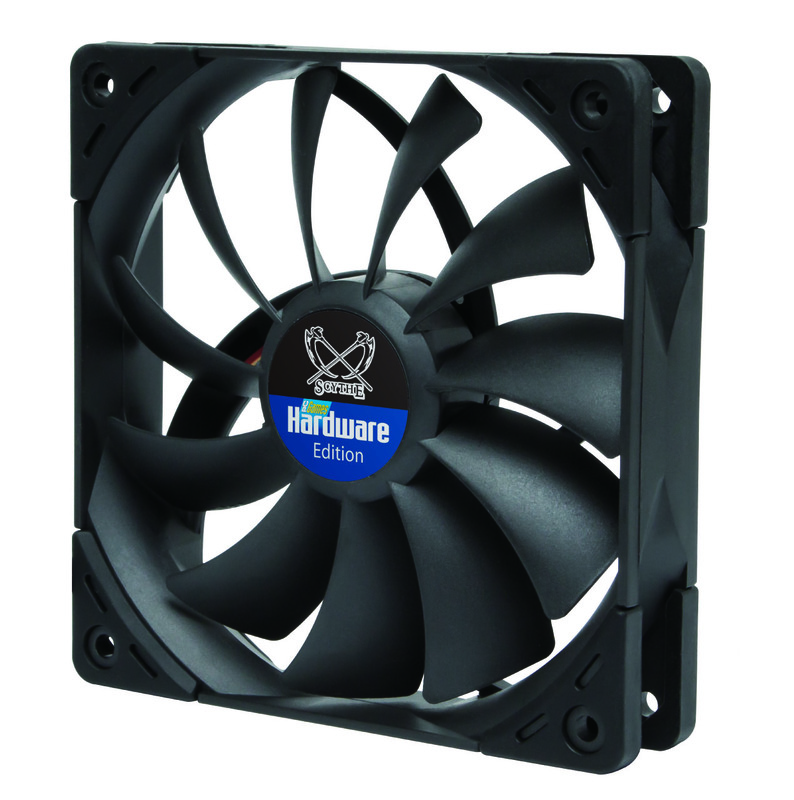 Decreasing the fan speed resulted in much lower noise levels, which could be brought down from 24,9 to mere 14,5 dBA! In addition to the technical tweaks of the fans, visual adjustments have been made as well. The dual-color fan design has been changed to a solid all-black appearance. The fans incorporate Scythe’s recently developed self-contained liquid Sealed Precision FDB bearing, which reduces friction and wear significantly and offers average lifespan of 120.000 hours. 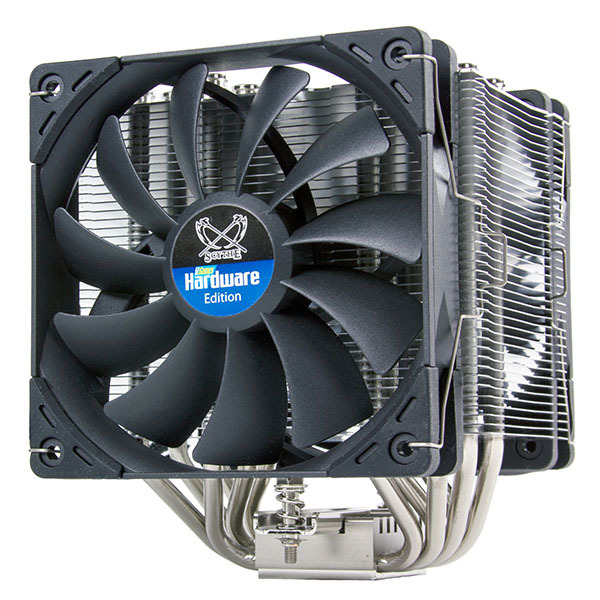 Special rubber-insulators are attached at the corners, preventing the transfer of vibration from the fan to the heatsink, resulting in greater stability and lower noise levels. 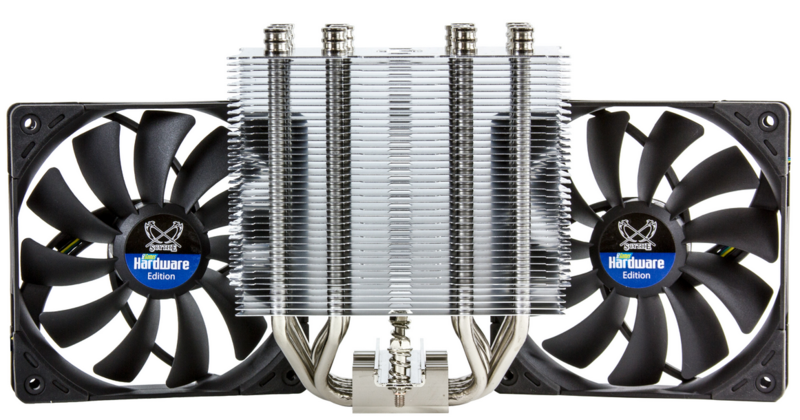 The Mugen 5 PCGH Editions heatsink remains the same, offering 6 high-quality all-copper heatpipes and a big aluminum fin stack. Outstanding memory modules compatibility is achieved thanks to the asymmetrical design. The solid copper base-plate has been slightly shifted for this purpose. Several layers of fins on the back of the heatsink have been shortened, to further increase RAM compatibility. Mugen 5 PCGH Edition is designed to fit into most on-market PC chassis, thanks to its height of only 154,5 mm. 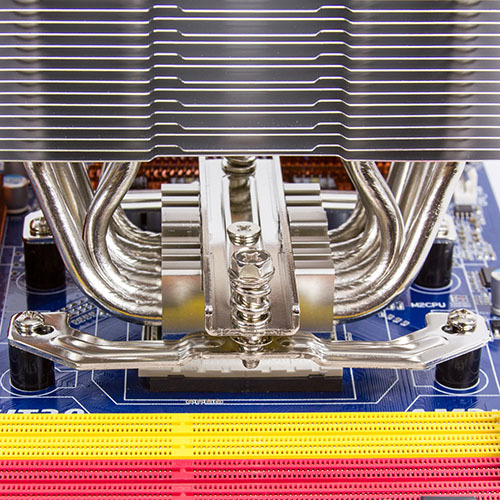 All copper-heatpipes as well as the copper-baseplate are nickel-plated, which improves the quality and prevents corrosion of the material. Scythe is utilizing the second generation of the Hyper Precision Mounting System (H.P.M.S. II) for Mugen 5 PCGH Edition. The mounting system is based on preassembled metal mounting bars with spring-loaded screws and a solid backplate. This has several advantages, such as faster mounting process and more even pressure distribution. The Mugen 5 PCGH Edition supports all the latest CPU sockets, including the Intel® Sockets LGA775, LGA1150, LGA1151, LGA1155, LGA1156, LGA1366 and LGA2011(V3) as well as AMD® Sockets AM2(+), AM3(+), FM1, FM2(+) and new socket AM4. The package contains all required clips for mounting, two fans with fan clips, long screw driver, user-manual as well as a package of thermal grease. Scythe Mugen 5 PCGH Edition with the model number SCMG- 5PCGH is available as of today on the European market with the MSRP of 47,00€ (VAT/Taxes not included).